Hover over the image above and click the arrows to scroll through the album. If you went on the trip feel free to visit the album here - feel free to caption using the comment options. An amazing trip to the Rafa Nadal Academy by Movistar - and Rafa was there! We were lucky of course. While no one would have wished it, Rafa Nadal’s decision to pull-out of the Basel Open and return to his base for treatment and training, was our gain. The great man seemed to be behind every corner, grin on face, cheerfully responding to our good morning greetings and requests for selfies. He even allowed us to follow him into his private indoor court to watch him train. 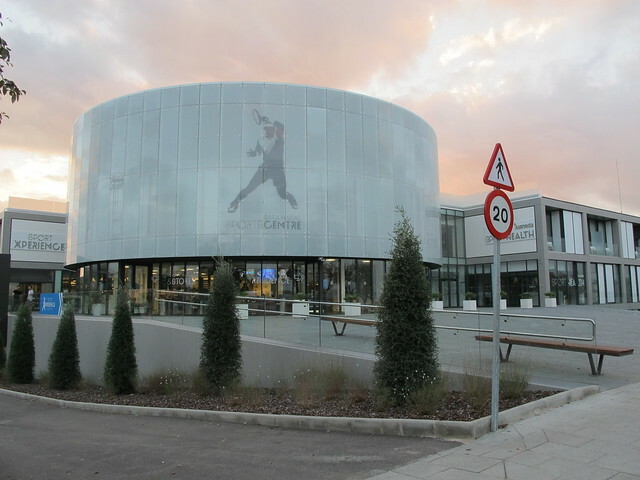 Local Tennis Leagues signed a partnership agreement with the Rafa Nadal Tennis Academy in the summer of 2017, but for most of us, this opportunity to play in the centre’s specially organised level 5 ITF Seniors tournament, was our first chance to visit the centre. We hope it will be the first of many opportunities to visit, either as individuals – all Local Tennis League players and supporters currently enjoy a 12% saving on individual bookings – or as part of special groups. It was also a chance to put names to faces and meet in person some of our league players. They came from Aberdeen to Poole, from Wimbledon to Edinburgh, but all shared the passion for friendly, competitive tennis. If this wasn’t exactly “a court near you” – though getting to Mallorca is no challenge – the Academy very quickly became our home from home. It wasn’t long before we felt like old friends. We bonded over breakfast, toasted each other’s good health over dinner and did our best to out-hit each other on court – but that’s tennis for you. As we were playing in an ITF tournament on this occasion, there were plenty of other tennis players to meet and they came from all over Europe. Firm friendships were made among these new players too, many of whom have now pledged to tell their tennis-playing friends at home about the Local Tennis League phenomenon sweeping the UK. If the next league starts in Hamburg or Stockholm, you’ll know why! League players were even fortunate enough to win a few titles, though truth be told the chance to take part in the Academy’s first ITF seniors event had attracted some top opposition – while most of us were protected from the surprisingly strong autumn sun, there was little we could do to defend against a few too many love and love hammerings. But for the most part we weren’t complaining. Playing a better player and learning from the experience is all part of tennis. You can see the whole draw and results on the ITF site. We were at the Academy for a week, most of us playing every day. We still found time to make trips into Rafa’s home-town, Manacor (easy walking distance), visit the on-site museum dedicated to Rafa’s achievements and make a group visit to neighbouring Porta Cristo for an evening meal in the famous Sa Pedra seafood restaurant where not only the Spanish King dines, but also Rafa himself. For many though, the favourite part of the whole trip was the two hour coaching session. It could only be an introduction to the skill and passion that these top pros bring to the task, but it whetted our appetite for more – look out for details of hosted Local Tennis League coaching weekends! Whether you come on your own, join us for one of the coaching trips or a future tournament, we hope you will get the chance to visit this exceptional centre. We can’t promise you that Rafa will be there, but as the tennis director, Joan, told us at our welcome drinks, it's Rafa’s values that underpin the Academy and inspire them to excellence. As Rafa recently tweeted: "The academy is an important part of my present and even mre important part of my future." Genuinely, this is a different tennis experience to any that you have had before. And that is a promise. Thanks to all the Academy staff for making this trip possible and special thanks to Sally Revell from the LTL team for her hands on organisational support. How likely are you to recommend this trip?